There are clear medical reasons to schedule a C-section delivery - including preeclampsia, complications with gestational diabetes and breech birth - but there are also C-sections scheduled every day of the year that are not medically necessary. In a world where impatience is taking over, scheduled C-sections are often about convenience; parents know exactly when baby will be born and that makes a difference to some couples. However, there are more and more research studies coming out linking C-sections with negative side effects – some lasting for decades after birth. This recent study reveals a possible connection between C-section delivery and childhood obesity. Included in the study were medical records for more than 1,200 women and children in Massachusetts. The women gave birth between 1999 and 2002. Women joined the study during pregnancy. Infants were weighed and measured at birth and again at six months of age. A follow-up measurement was taken at three years old. Body fat was measured during all three visits. The results revealed that just shy of 23-percent of infants were born via C-section. C-section mothers were less apt to breastfeed, they weighed more than vaginal delivering mothers and the infants were heavier. By the age of three, children born via C-section were almost twice as likely to be obese; not just overweight, obese. There is some thought that bacteria in the digestive system is different in children born via C-section than children born vaginally. Children born vaginally have more bacteroides and fewer firmicutes. The opposite results occurred in children born via C-section. Outside studies reveal more firmicutes in obese adults. 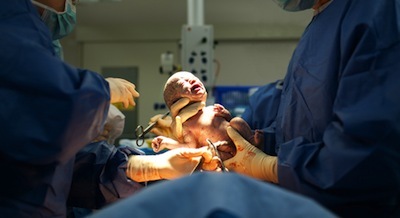 While there will always be reason for C-section delivery, researchers and doctors are readily fighting the increase of non-medically necessary C-section delivery. This study and others in the same field may be enough to push obstetricians to stop offering elective C-sections. Even if C-section is offered as an elective, pregnant women need to be advised of all the potential risk factors associated with that choice. Women and couples may be given the right to choose, but some medical experts believe women are not readily informed of the scope of possible side effects. Source: Susanna Y Huh, Sheryl L Rifas-Shiman, Chloe A Zera, Janet W Rich Edwards, Emily Oken, Scott T Weiss, Matthew W Gilman. Archives of Diseases in Childhood. May 2012.